On November 6, 2016 many of my wonderful friends and clients who have supported me over the years attended the new edition book launch party. We also sold many copies and portion of the proceeds were donated to Greater Vancouver Counselling Society. There are new sections added to the book including interview with Jody Vance, Dr. Ian Lee and Bruce Sellery, Money and relationships, tips about saving on travel costs, money, marriage and divorce. This entry was posted in book and tagged book, finance, finance planning, financial adviser, financial blog, Financial Sensei, money on November 12, 2016 by fsadmin. How can you be in business and not know about social media? For a lot of solo entreprenurs like myself and small businesses having a marketing department which takes care of social media marketing as well is out of reach. So if you have a chance to learn a lot in one day from different major platforms I am sure it would be a great event to attend. 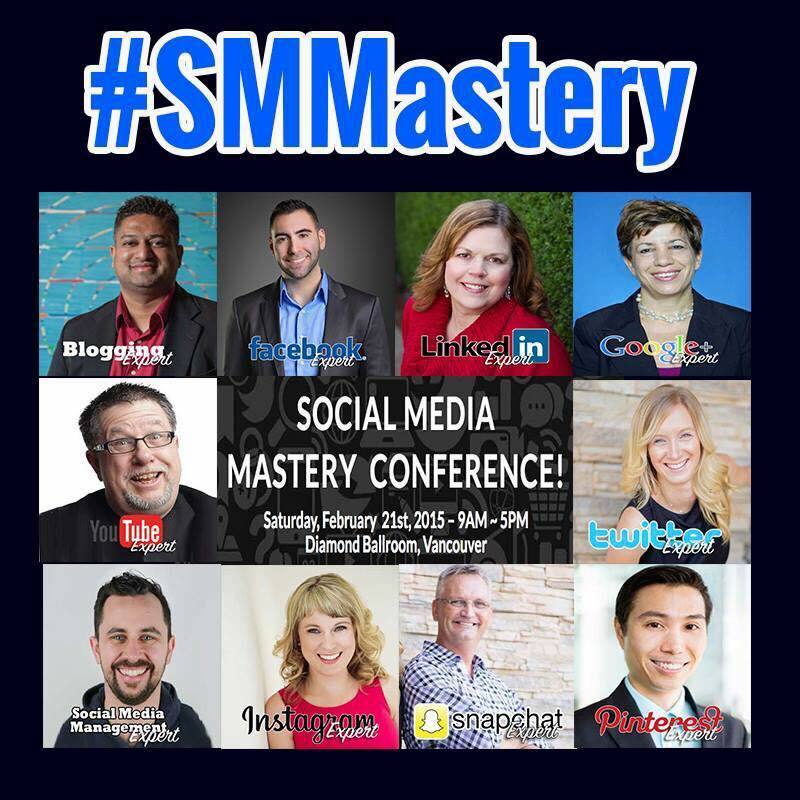 I know I am going to SMMastery this year on June 4 at Vancouver. There are a lot of local familiar faces and names between the speakers. I have known Ricky “Daddy Blogger” Shetty for few years now and am very proud with all the way he has come in such a short time from someone new to social media to a well known spekaer, author and blogger. I am pretty sure this would be a great netwroking oppotuniry as well. I have benefited from different social media platforms utilizing them for my business and now am looking forward to take my business to the next level. This entry was posted in Uncategorized and tagged conference, finance, finance planning, financial adviser, financial blog, money, social media mastery on May 12, 2016 by fsadmin. 1.What is the best decision you’ve ever made with your personal finances? To create a budget and stick to it. 2.What is the worst decision you’ve made with your personal finances and what did you learn from it? I wasn’t tracking expenses and found myself spending much more than I realized. 3.What advice would you give regarding personal finances? Understand your money and have a plan. Don’t fear it like most do. This entry was posted in book, Uncategorized and tagged book, finance, financial adviser, financial blog, financial planning, interview, money, Wendy McClelland on April 6, 2015 by fsadmin. TFSA has been around only since 2009 and no wonder why many people don’t know how it works. RRSP has been around since the late 50s and people still don’t know how it works! They are both tax sheltered registered accounts that you dont pay tax on the return of the investment you hold in them. Major difference is RRSP contribution is tax deductible and TFSA contribution is not. However when you take money out of the RRSP you pay tax on it and when you take it out of the TFSA you don’t. So which one is better option for you? Hate to give you this cliche answer but it depends and in different stages of your life this answer may change. But to give you a very general answer for people who are in the lowest tax bracket, RRSP has no point. This entry was posted in Money and tagged book, finance, financial adviser, financial blog, financial planning, money, Registered Retirement Saving Plan, RRSP, Tax Free Savings Account on January 29, 2015 by fsadmin. This entry was posted in book and tagged book, Daddy Blogger, finance, financial adviser, financial blog, financial planning, interview, money on December 1, 2014 by fsadmin. This entry was posted in book, Money and tagged book, finance, financial adviser, financial blog, financial planning, money on November 7, 2014 by fsadmin. What is the best decision you’ve ever made with your personal finances? What is the worst decision you’ve made with your personal finances and what did you learn from it? What advice would you give regarding personal finances? This entry was posted in Money and tagged book, finance, financial adviser, financial blog, financial planning, LinkedIn, money, Registered Retirement Saving Plan, RRSP, Tax Free Savings Account on October 20, 2014 by fsadmin. This entry was posted in book, Money and tagged book, finance, financial adviser, financial blog, financial planning, interview, money on October 15, 2014 by fsadmin. This entry was posted in Uncategorized and tagged finance, financial adviser, financial blog, financial planning, money, Registered Retirement Saving Plan, RRSP, Tax Free Savings Account on October 13, 2014 by fsadmin.